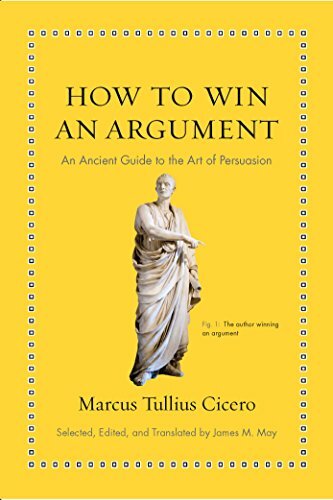 How to Win an Argument – An Ancient Guide to the Art of Persuasion is by far the best book I have read on oratory. James May translated Cicero’s words into enlightening and pleasing writings. Thanks to May, the rhetorical wisdom of Cicero is comfortably accessible to us all. The rest lies in “师父领进门，修行靠个人”. 1. Nature, art, and practice, practice, practice. These are the three requisites for becoming an effective speaker. The good speaker must possess certain qualities bestowed by nature, for example, a pleasant voice and the ability to project it. Knowledge of the systematic body of rhetorical precepts, that is, mastery of the “art” of rhetoric, is likewise essential. Finally, one’s natural gifts and knowledge of the rules must be polished and enhanced by diligent and purposeful practice. 2. Eloquence is a powerful weapon. The human capacity for thought and the ability to express that thought through persuasive speech are, according to Cicero, what separate humans from all other creatures. When channeled correctly and informed by good thinking, eloquent speech is the most powerful weapon for effecting good in society. The most gifted speakers should always keep in mind the power that their speech wields over others, and use it for the betterment of their communities. 3. Identify, arrange, memorize. When setting out to construct an argument or a speech, one should first identify the point at issue and discover appropriate material for proving it; next arrange that material effectively and strategically; apply a fitting style; then (if necessary) commit it to memory; and finally, employ appropriate ways to deliver the arguments. These are the so-called activities of a speaker, outlining the tasks and the order in which to construct an effective speech. The first three activities can also be employed effectively in written composition. 4. Not by logic alone. Persuasion involves more than simply arguing logically. The speaker has available three sources of persuasion: rational argumentation, proof based on character, and emotional appeal. Aristotle identified these sources of proof or persuasion, and Cicero recommends using all of them – to teach, to delight, and to move our audience. One can argue using the tools of logic, for example, deductive and inductive reasoning as illustrated by the syllogism and example; or rely on proof based in the portrayal of one’s character; or persuade by appealing to the emotions. There are times and places for each, and the skilful speaker will know when and where to engage these various modes of proof. 5. Know your audience. When actually composing the words, sentences, and paragraphs of an argument or a speech, the speaker should remember that different styles exist, and that a particular occasion and audience demand a particular and suitable style, be it the plain, middle, or grand. It makes a difference whether one is arguing with a friend, or presenting a position paper in a class, or arguing a brief before a court of law. The effective speaker will adapt his or her level of style according to the occasion and the audience that is being addressed. 6. Be clear, be correct. Regardless of the particular style adopted, speakers will assiduously apply the “virtues”, or qualities of style, to their speech or argument: correctness, clarity, distinction, and appropriateness. No matter the stylistic level at which an argument is pitched, the speaker must ensure that the language employed is correct in its syntax and grammar, that it is expressed in the clearest possible way, that it is made distinctive by the use of figures of thought and speech, and that it is entirely appropriate to the time, occasion, and the audience. 7. Delivery matters. Sometimes it’s not what you say, but how you say it. Cicero understood and appreciated the power of delivery, that is, the way a speech or argument is presented. All of us, perhaps, have experienced a teacher who was in possession of a brilliant intellect and encyclopaedic knowledge of a subject, but could not present that material clearly and cogently; conversely, we have perhaps also heard a politician or a salesman sweep people off their feet with a dazzling presentation that, under closer inspection, lacks any real substance. Effective delivery of an argument or a speech, employing both voice and gesture skilfully, can be the decisive factor in winning an argument. 8. Imitation is the sincerest form of flattery and more. Cicero believed strongly in finding good models to imitate. The best speakers are those who have identified excellent models and who have made it a habit to imitate their strengths, while leaving aside their weaknesses. Several models are worthy of consideration, gleaning what is best from each. 9. The pen is often mightier than the sword. The tongue may be a gifted speaker’s most important weapon, but the pen, according to Cicero, is close behind. If you wish to improve your speaking ability, writing – and writing variously and much – is, Cicero maintains, the key to achieving your goal. 10. Words, without substance, are hollow things. Cicero believed firmly that the most effective, persuasive speech follows naturally from the underlying subject matter. Without solid and extensive knowledge as a foundation, the words that flow from a speaker’s mouth are nothing but child’s prattle. For this reason, Cicero’s ideal speaker is one who not only knows and understands the rules as outlined in the “art” of rhetoric, but even more importantly is a person who is steeped in the knowledge of literature, history, law, philosophy – in short, in all of those subjects we know today as the “liberal arts”. As an earlier Roman, Cato the Elder, was fond of saying, “grasp the subject, the words will follow”.